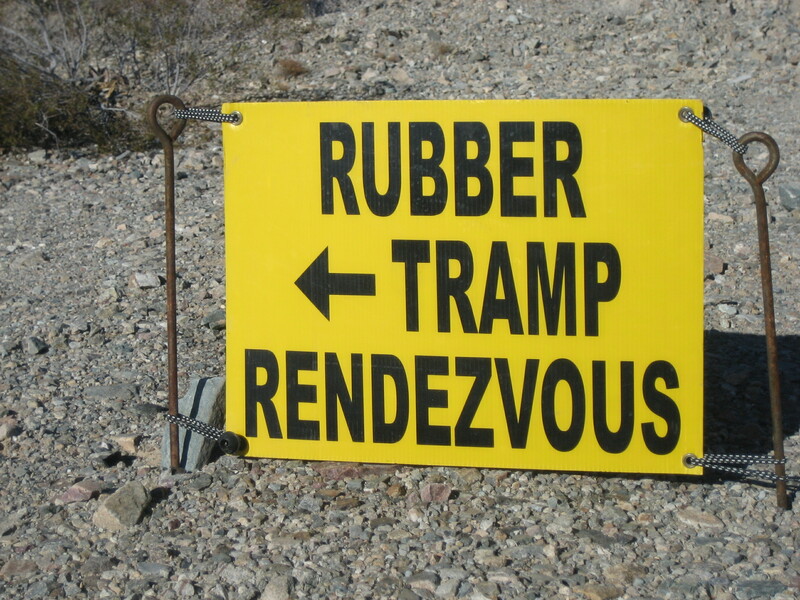 I recently attended the Rubber Tramp Rendezvous (RTR) in Quartzsite, Arizona. If you don’t know the first thing about the RTR, you can find more information at on the Cheap RV Living website. You can also read my posts about my experience at the 2015 RTR. The 2016 RTR ran January 5-19, and was once again held at Scaddan Wash. Everyone agreed there were more people at the 2016 RTR than ever before, but I haven’t heard an official count of attendees. This is what the Scaddan Wash area looks like. In 2015, I parked very close to the main fire pit/meeting area, but this year I made my home near far end of the road. Being so far back forced me to walk more to attend workshops and visit friends. The weather was cold and rainy the first few days of the RTR. I drove in the rain to get to Quartzsite, and I enjoyed hearing raindrops on the roof of my van the first couple nights in the desert. 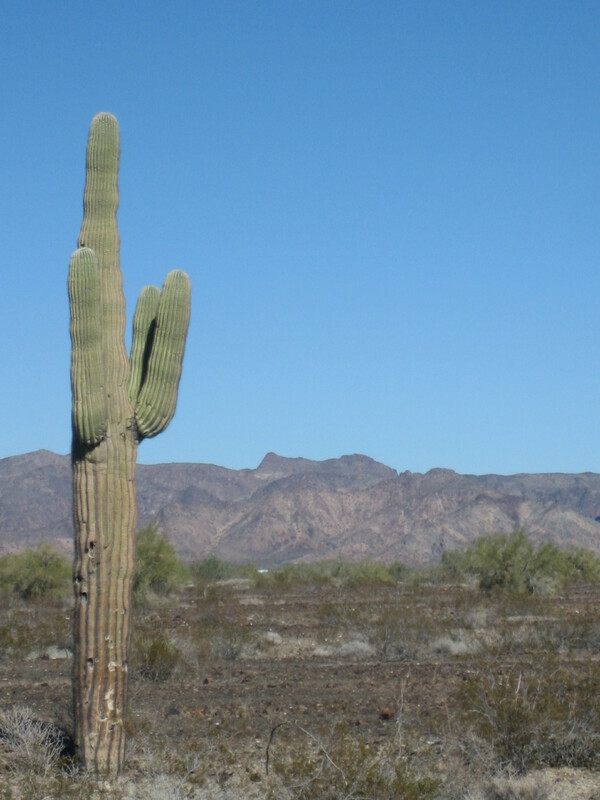 Although the low temperatures were cold for Quartzsite, they still beat the lows in most of the U.S. Many folks I know used their Mr. Buddy heaters, but I never even pulled mine out of its tub. On most days of the gathering, at least one educational seminar was offered. Seminar topics included the following: gold prospecting; work camping; setting up and using solar power; gadgets; lithium batteries; cooking methods; making a dream catcher; traveling to Algadones and Baja, Mexico; safety in the desert; boondocking; nature photography; car dwelling; and receiving mail, health insurance, and residency. I only went to two seminars this year, the welcome seminar on the first morning and the seminar about living in a car. Most of the seminars were repeats from last year, and I either wasn’t interested in the topic or felt I already got the information I needed from the seminar when I sat through it before. Most mornings I didn’t want to carry my chair all the way to the meeting area and sit in the sun for a couple of hours. I did attend the two women’s meetings at the RTR. Each meeting had about 30 women in attendance, although it wasn’t all the same women both times; many women only attended one of the meetings. I did not facilitate the women’s meetings this year, which was something of a relief. I won’t be giving a full report of the meetings, as both consisted mostly of introductions. In the second meeting, women shared information in answer to specific questions such as How do I get a job work camping? How do I eliminate bodily wastes while living in my car/van/RV? How do I get electricity in my van? What do folks drive and what kind of gas mileage does that vehicle get? My favorite RTR activities were again the group meals. As we did last year, everyone who wanted to participate contributed canned or fresh ingredients to be added to chili one week and soup the next. Once again, the Chef and his crew turned the contributions into two delicious meals. At the chili feed, there were three offerings: vegan chili (which I ate and can say was Yum! ), chili that was a little hot, and chili that was a little hotter. Folks also contributed homemade cornbread; crackers; and toppings like cheese, onions, and cilantro. At the soup dinner, the soups offered included a vegetarian minestrone-type soup, chicken noodle, beef barley, and one with spicy sausage. Crackers were also provided, as well as dessert! I was in line with Lady Nell and Mr. Jay, and they didn’t care for dessert, so they gave me their share of the sweets. I ended up with a no-bake cookie, a chocolate chip cookie, and some sort of chocolate chip/coconut bar, all homemade. Super yum! The third group meal was a potato bake hosted by the same couple who made it happen last year. The potatoes (180 of them!) were baked in the coals of the main fire pit, and folks contributed just about any topping one could imagine putting on top of a baked potato. 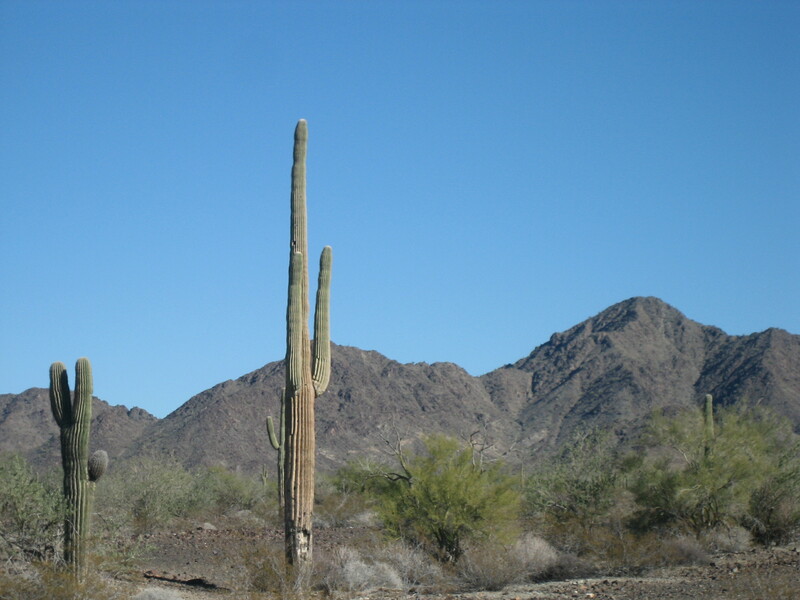 Cacti and mountains surrounding the RTR 2016. I was a lot more social in 2016 than I was in 2015. Being social was easier for me this year because I already knew folks. I often have difficulty approaching a stranger and striking up a conversation, but I can usually think if something to say to someone I’ve already met. In addition to reconnecting with people I met last year, I actually made several new friends, at least two of whom I think I will stay in frequent contact. My personal highpoints of the gathering happened when I met people who told me they read my blog. I have readers! Mr. Jay was the first person I spoke to at the RTR. When I knocked on the rig to find out if Lady Nell were home, Mr. Jay answered the door. After a few moments of chit chat, he asked kindly, And you are? I said, I’m Blaize. His face broke into a smile and he said, Oh! I read you! It was a moment of great happiness for me. Very cool. Excellent recaps. I also follow Bob’s blog and forum but haven’t yet attended an RTR. It’s on my bucket list for 2017, so I hope to meet you there next year Blaize. Good to hear about the vegan/vegetarian options for the meals, I was wondering about that. And also what to expect with so many pups running around everywhere. I’ll watch where I walk and put my chair! Further, as you know, Bob’s blog (www.cheaprvliving.com) is a great resource. Glad you are able to follow it. I don’t go on the forums much, but I know a lot of people who do. The fellow who’s bottom-lined the group meals for the past two years has made sure to offer vegetarian/vegan options. I think one way to make sure it keeps on that way is to volunteer to help with those meals and insist on something meat-free. The dogs really had the run of the RTR both years. Not a great environment for people scared of or allergic to dogs. I believe Bob said on his blog to camp farther out if one didn’t want to deal with dogs, but many, many dogs in 2016 ran around wherever they wanted with absolutely no supervision. I saw a dog pee on my friend’s tent before she could do anything about it. At the welcome meeting, Bob basically said dogs would pee wherever they wanted and folks should just deal with it. I threatened to put my own pee in a spray bottle and squirt the property of the human belonging to any dog who peed on me or my stuff. Since I didn’t go to many of the seminars, it didn’t really become an issue for me. But you can probably tell I’m a little disgruntled about the RTR dog situation. I’ll definitely volunteer on the food committee then, thanks for that info. So funny about you threatening to spray your pee on the pee perpetrator owners stuff. Might not be a bad idea. Lol. This might be a bit far fetched, but if the dog owners would camp together and buy some of that portable orange fencing and fence off a large dog park area where they’re camped that would solve the issue and be a win-win. I’m sure the wildlife don’t appreciate all those dogs running around doing their thing either. I really like pups in general, but not when they’re out of control like that, in addition to having to listen to lots of barking. Mind you, listening to coyotes howling is a whole different story! I agree with everything you said in this comment, Further, from liking dogs in general to liking the sound of coyotes. I don’t think the RTR dogs barked a lot. I don’t remember that bothering me at any point. I just really don’t like being peed on! Very nice! I really wanted to go! But I’ll be sure to be there next year. I’ll have a year and half of van dwelling in at that time. But could sure use some of the information at the workshops – especially the cooking one and the solar one. Those are the two things that are most on my mind at the moment. To help keep dogs away from your tent or rig, save and wash a few of your regular metal food cans. Add a handful of pebbles to each can and duct tape them closed (seems easier if you save the lid and stick the first piece of tape to that). Keep them handy, and when a dog comes near (esp a male), throw the can at them. You don’t have to wait until they pee. You don’t have to hit them, but try to hit the ground near their face. The rattle is usually unfamiliar, startles them, and they run off. Thanks for the suggestion, Sue. I will give to give this a try next time there are too many dogs running around and trying to pee on me and my things.